Heal from the aftermath of addiction and move toward wellness as individuals and as a couple age. 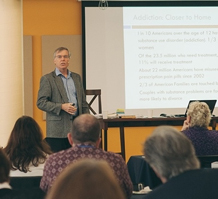 Tools and interventions taught in this workshop are adapted from the Gottman Method to help couples develop a Couple Recovery through increasing communication and understanding, establishing appropriate boundaries, and healing from the impact of addiction and recovery. The workshop provides opportunities to practice the techniques, so you will feel ready to use them with individual couples and/or with small groups of couples. Aftermath of a Regrettable Incident (Pocket Guide): This powerful guide from Gottman Method Therapy provides strategies and tools to help couples successfully process their fights, heal their hurts and get back on track after a fight or regrettable incident. It outlines the 5 steps needed to process conflict and reclaim good will. Aftermath of a Positive Event Guide: This intervention, based on the Aftermath of a Regrettable Incident, outlines a 5-step guide to help couples process a positive experience or event, to understand why it went well and what it meant to each person, and ways to learn from the experience to then incorporate that into their relationship. $50 off for Level 1 and/or 2 Participants, sponsored by The Chicago Relationship Center in July, 2017. You will find the option to pay for this additional class after you submit the registration form for either Level 1 or Level 2.